The DEWALT 20V MAX* DCD777C2 Compact 1/2-inch Brushless Drill/Driver is built with a powerful brushless motor delivers 340 unit watts out (UWO) and up to 57% more runtime over brushed motors. The ergonomic comfort grip handle provides ideal balance and tool control. The LED light has a 20-second trigger release delay that provides increased visibility in dark or confined spaces. The drill/driver can complete a wide range of applications to help you power through the toughest of jobs. Bring your project ideas to life with this BLACK+DECKER BDCDDBT120C SMARTECH 20V MAX Lithium Single Speed Drill/Driver. It's lightweight design and built-in LED light won't stop you from working in tight or dark spaces. The BLACK+DECKER app (iOS and Android compatible) links with your SMARTECH batteries so you can locate, lock, and monitor your tools for convenience. You can also use the built-in portable charger on your SMARTECH battery to conveniently charge your mobile devices. The Bosch DDH183B 18V EC Brushless Brute Tough 1/2 In. Drill/Driver is robust and powerful, a tool that features KickBack Control and a precision clutch. KickBack Control is an integrated acceleration sensor that automatically shuts the tool down when a potentially dangerous rotational torque reaction occurs in a bind-up scenario. The precision clutch has 25+1 settings, for reduced over tightening, fewer damaged screw heads and a longer tool life. With an upgraded, heavy-duty all-metal chuck, the drill has great bit grip and torque transfer. Its efficient EC Brushless motor delivers outstanding runtime and longer motor life. It produces 663 In.-Lbs. of torque, and it has variable-speed selector one optimized for high-torque driving (0-480 rpm) and one best for high-speed drilling (0-2,100 rpm). Reduce the risk of injury from kickback or bind-up situations with Bosch Active Response Technology featured in the new the Bosch HDH181X 18 V Brute-Tough 1/2 In. Lithium-Ion hammer drill/driver. The innovative on-board acceleration sensors automatically shut the tool down when a potentially dangerous torque reaction occurs. The Bosch engineered 4-pole motor provides 752 In./lbs of torque, making it powerful and efficient for drilling a broad range of high torque bits such as spades and augers. As with all Bosch best built cordless tools, advanced electronic motor and cell protection help prevent overheating and overloading for extended tool life and runtime. A built-in LED light illuminates the workspace for optimal visibility. All-metal Bosch gears and Durashield tool housing hold up in even the toughest jobsite conditions, including withstanding multiple 12 Ft. drops onto solid concrete. The new Hilti SFD 2-A Cordless Screwdriver is designed to reduced noise while providing reliable fastening performance needed to get the job done. The new SFD 2-A is the ideal solution for working in occupied spaces. With its quiet 15 position torque clutch, professionals have more control when fastening, protecting finished products and base materials. 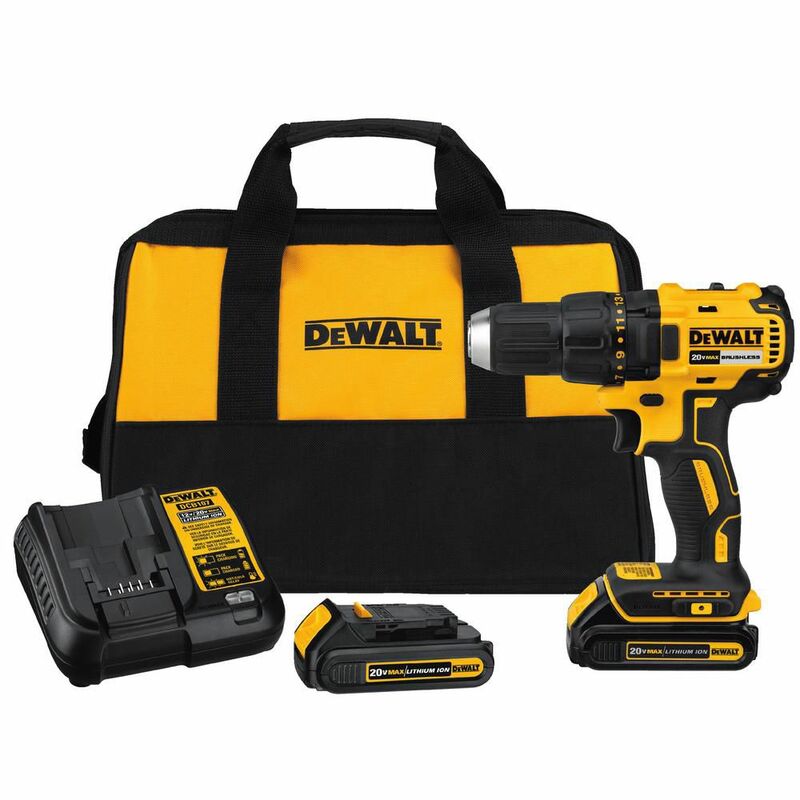 20V Lithium-Ion 1/2-inch Cordless Compact Brushless Drill Driver with 2 Batteries and Charger The DEWALT 20V MAX* DCD777C2 Compact 1/2-inch Brushless Drill/Driver is built with a powerful brushless motor delivers 340 unit watts out (UWO) and up to 57% more runtime over brushed motors. The ergonomic comfort grip handle provides ideal balance and tool control. The LED light has a 20-second trigger release delay that provides increased visibility in dark or confined spaces. The drill/driver can complete a wide range of applications to help you power through the toughest of jobs. 20V Lithium-Ion 1/2-inch Cordless Compact Brushless Drill Driver with 2 Batteries and Charger is rated 4.7 out of 5 by 1731. Rated 2 out of 5 by Keith from Not the power needed. Nice drill for homeowner.... Not the power needed. Nice drill for homeowner. Rated 5 out of 5 by Pop from Very strong and light weight. No fatigue at when using this cordless drill. Get buy for me. Very strong and light weight. No fatigue at when using this cordless drill. Get buy for me. Rated 5 out of 5 by NorthNJ from Great drill for quick jobs around the house. Love it. Great drill for quick jobs around the house. Love it. Rated 5 out of 5 by SoCalDAH from Works as expected. Quality appears to be good. Works as expected. Quality appears to be good. Rated 5 out of 5 by HomeDepotCustomer from Great drill. Battery are long lasting. ... Great drill. Battery are long lasting. What is the difference between DCD777C1 and DCD777C2? The difference between the DCD777C1 and DCD777C2 is that the DCD777C1 will include one (DCB201) and the DCD777C2 will include two (DCB201). Yes, the DCD777C2 will allow a belt clip to be added. The belt clip (screw included) is part # N268241. Does the price include the bag as pictured?